Johnny Preston had one of the great pop novelty hits of the late 1950s-early '60s in "Running Bear" (thanks to rameyblue for the clip), which was written by J.P. "The Big Bopper" Richardson, who, along with Bill Hall and (yes!) George Jones, did the whoops and toomba-toombas that accompany Preston's vocal. The Bopper died in a plane crash with Buddy Holly and Ritchie Valens before the song became a hit. Yesterday, Johnny Preston went to join Running Bear and Little White Dove "in that Happy Hunting Ground". Thanks to FB friend Georgene Z. Russell for the tip. Leonard Bernstein: Ravel's Piano Concerto in G, 2nd movement. I think of Leonard Bernstein principally as a composer and conductor rather than a pianist, though his performance here, in my opinion, is superb (he can't resist doing a bit of conducting, too, when he can get one hand free). This is the second movement, adagio assai, of Maurice Ravel's Piano Concerto in G (for the first and third movements see here and here). I'm a sucker for impressionist music, just as I am for impressionist and post-impressionist painting. Thanks to loyal Brooklyn Heights Blog reader and commenter AEB for bringing this to my attention, and to masiurb for the clip. Dermot McEvoy on the Paul Schiffman memorial. On a night when Hollywood honored a stammerin’ British welfare king, the Lion’s Head roared back to life like it was 1977 in honor of one of their favorite sons, the late Captain Paul Schiffman. The aisles were jammed at the bar and the back room was packed with Generation V (for Viagra). If Shifty worked the bar there was no doubt that the death penalty would have been meted out on the first person who would dare order a Bloody Mary. It was just like the old days—there were writers, poets and newspapermen mingling with corporate lawyers. Seamen debated Melville and the true meaning of Shifty with the publishing crowd. Denver Dave Coles and Richie Sisk ran away from their journalism jobs in Washington, D.C. to spend one last night with Captain Paul. Writers Vince Patrick, Pete Hamill and the great George Kimball talked into the night, while the rest of us gobbled up the wonderful buffet spread that Joanie Leinwoll had put together. We were lucky enough to have Tommy (Sugar) Butler’s daughter, granddaughter and nephew in attendance, along with Alphie McCourt. It was a sad reminder of how many of our friends we have lost over the years. In the last eighteen months alone the list has been brutal: Pulitzer Prize-winner Frank McCourt; sportswriter Vic Ziegel; impresario Art D’Lugoff; character actor supreme Val Avery (somewhere in the great beyond, presumably eating someone’s liver out); journalist Sid Zion; Liam Clancy, “the greatest balladeer of the 20th century”; David Markson, one of the great novelists of the 20th century; and ace journalist Dennis Duggan, who preceded Frank in death. I’ve probably missed someone and if I did I do apologize. You are all in our hearts. The night was capped off with stories about Shifty. Mike Wholey, a master seaman himself and close friend of the Captain, journeyed down from Woodstock to tell a Shifty story I’ve never heard before. When Das Boot came out in the early ’80s Mike decided to go see it. The theater was empty during the afternoon as the movie started. Well, pretty soon the Nazis start torpedoing the U.S. Merchant Marine. “Mudderfuckin’ Nazi scum,” came the shout from the back. When the movie is over Mike gets up to walk out. Our narrator? None other than Captain Paul Schiffman, USMM! The night finally came to an end with the tin whistle of the great David Amram’s rendition of “Will You Go Lassie, Go.” There wasn’t a dry eye in the place. The crowd asked “What would Shifty do?” Obviously heeding heavenly instructions, most retired to the bar and ordered a Jameson. Good night, Captain Schiffman. You would never believe it, but you will be sorely missed. God bless. 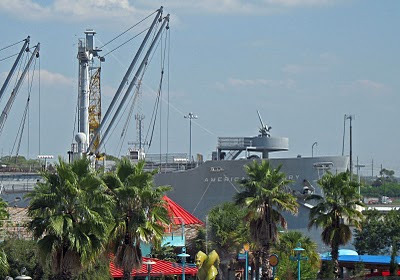 The photo above is of the bow of the cargo ship American Victory, which I took while visiting Tampa in 2006. 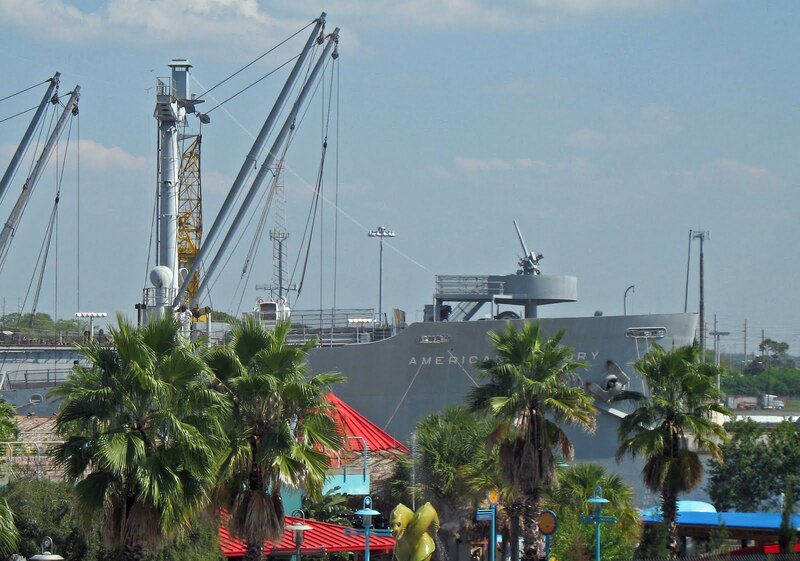 She is preserved there as a floating museum, and takes occasional short cruises into Tampa Bay. Last night, as Mike Wholey was giving his recollections of Paul, he mentioned a conversation in which it came out that he and Paul had both served as officers on this ship, but over two decades apart. Not only that, but Paul had been on her maiden voyage, and Mike on her last as a freighter in active service.